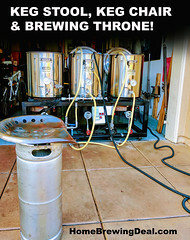 Coupon Description: HomebrewSupply.com currently has a coupon that will get you a home brewing banjo burner and stand for just $64. These are the same burners that I am using in my home brewing rig and they work fantastic. They work great for 5-30 gallon beer batches! This powerful, high-pressure propane stove features a 10 inch iron burner that emits 210,000 BTUs and as a result, large pots of water heat very quickly. Designed with a height of only 9-3/4 inches for safety, the one-piece welded steel stove is very stable and eminently portable. Included with the stove are 30 PSI regulator, 48-inch hose, and valve assembly. All Bayou Classic stoves are designed for use with 20-pound LP gas cylinders. Coupon Description: Right now, if you purchase 2 big mouth bubblers from Northern Brewer, you can get free shipping on your order with the FIRSTGLASS coupon code. Northern Brewer has good prices on some of their home brewing gear, but rarely beat the prices at MoreBeer.comand Adventures in Homebrewing, especially after expensive shipping costs are factored in. 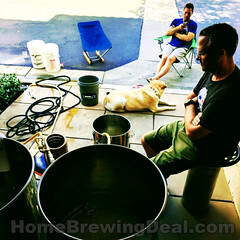 More Beer offers free shipping on your home brewing orders over $59 and has the best customer service in the business. Coupon Description: MoreBeer has a coupon code that will get you a Home Brewing Beer Bottle Capper for $11.99. This promo code is only good while supplies of the promotional beer bottle capper last. Home Brewing Systems and Brew Rigs on Sale! Promotion Details: Home Brewing Systems and Brew Rigs on Sale! Sale Description: Adventures in Homebrewing has a sale going on where you can save some cash on home brewing systems from Ruby Street and Blichmann. These are tried and true homebrew systems and several of the models feature digital control and automation functionality. 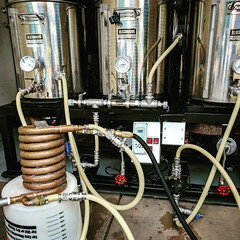 Coupon Description: HomebrewSupply.com currently has a promo code that will save you 15% on your homebrewing supply and equipment order. This home brewing flash sale only lasts for 36 hours, so act now and save big! Coupon Description: Fight back these hot summer temperatures and master fermentation with a Johnson Digital Fermentation Temperature Controller. These Digital Temperature controllers are perfectly suited for home brewing fermentation. Some home brewers do not realize how critical fermentation temperature is in homebrewing, but it is critical. Your fermentation temperature has a direct and noticeable impact on the final flavor of your beer. 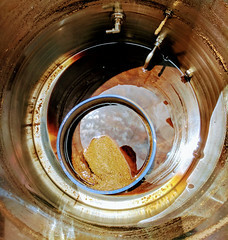 If your home brewing fermentation temperature gets to high, your beer can form off flavor esters and fussell alcohol. If the temperature is too low you may not ferment completely and be left with a sweet beer or too high of carbonation if you bottle. A temperature controller can fix all of that and right now More Beer has a great sale going on for one of the most popular home brewing controllers out there! If you act now, you can save $10 on a Johnson digital temperature controller. The Johnson digital homebrewing thermostat features an Anti Short Cycle Delay. Cycling is the rapid turning off and on of an electrical device and over time cycling can harm your appliance. The Johnson controller allows you to set a time interval, in minutes, that keeps the controller from turning on right after it shuts off no matter what the temperature reading is. This can be very useful when you are using a 1 degree of differential setting for tight control but want your compressor or power supply to have a minimum time period of rest before it turns back on. With this home brewing temperature controller, you can control temp ranges of -20 to 220F.